Suffused with the history and landscapes of the American West—its otherworldly flora and fauna, its rugged loggers and bridge builders—the new novella by Denis Johnson, the National Book Award-winning author of Tree of Smoke captures the disappearance of a distinctly American way of life. As on Nobody Move and Jesus’ Son , Johnson’s words are narrated by Will Patton to great effect. Said Johnson, “Will is the premier performer of my words, and he makes Train Dreams feel like some kind of spiritual breakthrough.” Patton also commented, “When I first started narrating audiobooks people would ask me ‘what author would you most like to record?’ My answer was always ‘Denis Johnson’.” The end result of their collaboration is an epic in miniature, and one of Johnson’s most evocative and poignant fictions. 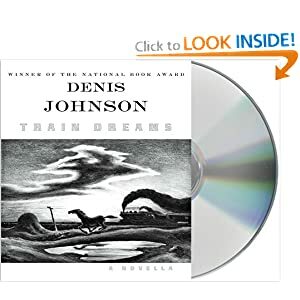 Denis Johnson is the author of six novels, three collections of poetry, and one book of reportage. His novel Tree of Smoke was the 2007 winner of the National Book Award and won the 2008 Audie Award for best Literary Fiction audiobook. My Take on the BookThis book was full of rich description of the west that simply draws you into the story itself and makes you want to listen further. The story itself is gripping as it shares the loss of the main characters family and the way in which one man can work to rebuild from tragedy to start a new life. While I had never read or listened to any of Denis Johnson's work in the past, his great use of imagery and attention to detail were remarkable. You can easily close your eyes while listening to this and see yourself there with the main character (which in my books is the true trademark of a great audiobook). Overall though the characters were strong and the plot worth sharing. I would highlt recommend this book!